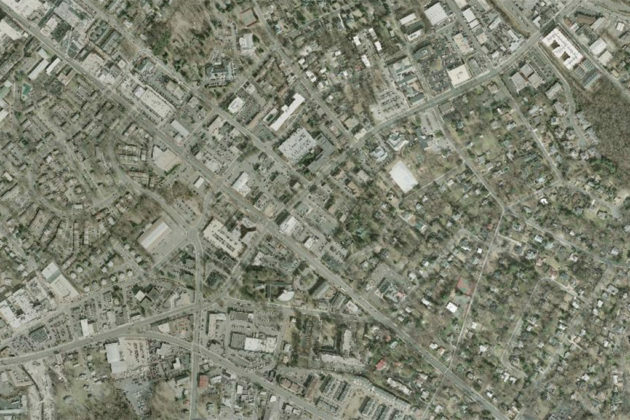 Falls Church a city almost exactly 100 years older than the first daguerreotype cameras. It was a recruiting station for the American militia in the Revolutionary War and the scene of minor skirmishes throughout the American Civil War. 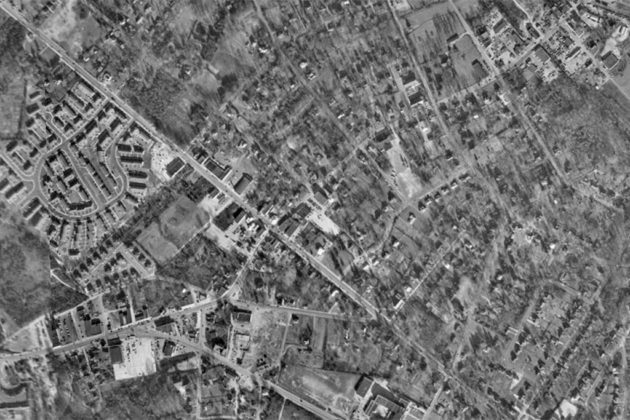 But even so, it’s a city that’s gone through numerous changes over the last 80 years of Fairfax County’s aerial photography. 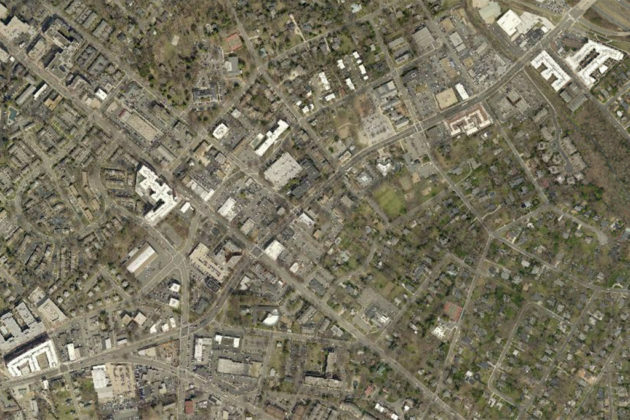 Unlike most of nearby Tysons, Falls Church already has the visible bones of a small city by the photography from 1937. The familiar street network is in place, with several homes situated along the intersection of Broad and Washington Streets. 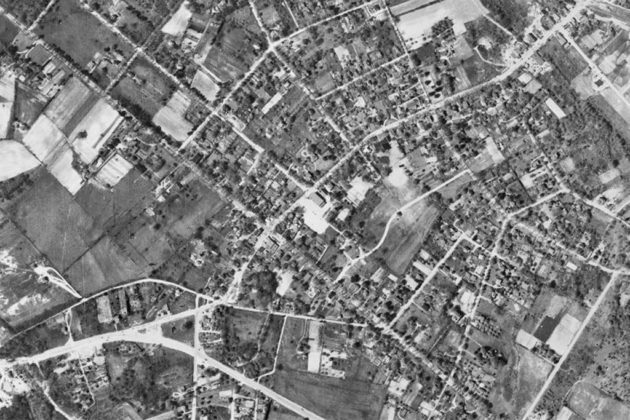 By 1953, the Winter Hill neighborhood was built, and the cookie-cutter pattern of American suburbia was starting to stamp down on fields around the town. 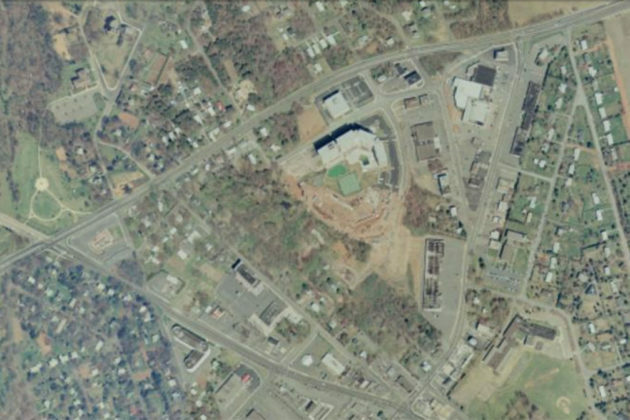 The aerial photography is spotty after that, with no coverage in the 1960s or 70s, but returns in 1980, when downtown Falls Church’s transition to strip malls and small shopping centers was in full swing. New streets, like Annandale Road, also connected businesses along Washington Street to homes and other businesses along Broad Street. 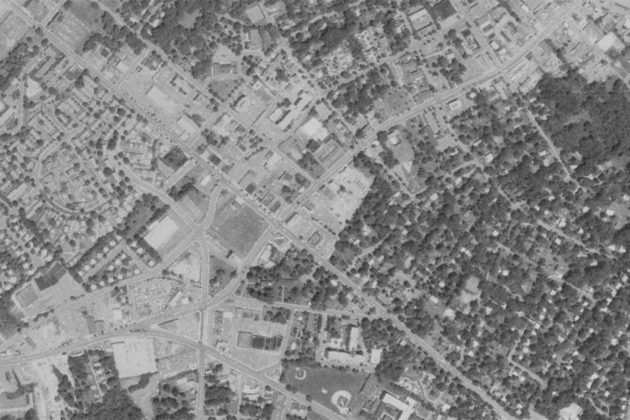 There was less change between 1980 and 1990 though, when most the changes took place at the western end of the downtown area where new apartments and new shopping centers were built closer to Lee Street or with new northeast of Broad Street. 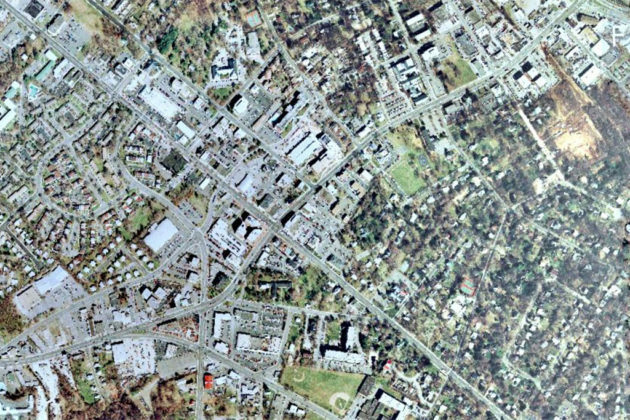 Like nearby Vienna, the pace of development in Falls Church slowed dramatically after 1990. 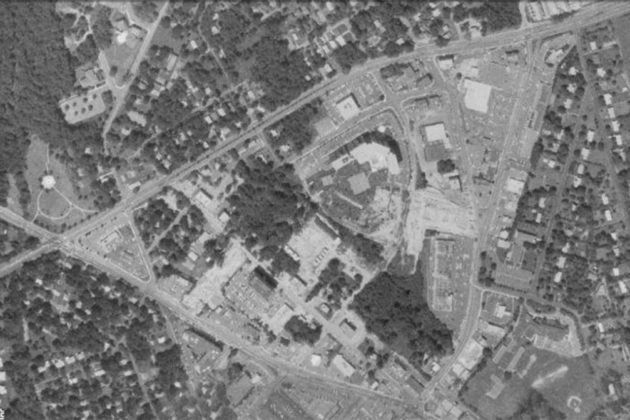 Very little of the town’s shape and structure changed between 1990 and 2007, and less between 2007 and 2017. One of the most visible changes in downtown Falls Church was the construction of the Harris Teeter in 2016, the first grocery store in the city’s downtown in three decades. Nightlife may be one of Tysons’ weak spots, but local music in the area has a long history — and a wide-open future. 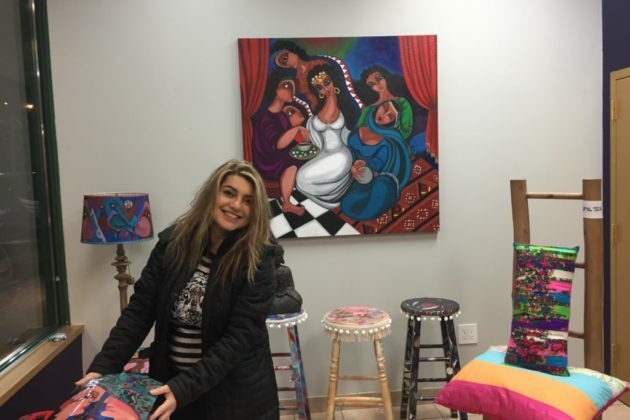 The Fairfax scene is very diverse, drawing on artists who are local to the county as well as those from elsewhere in the greater D.C. area. 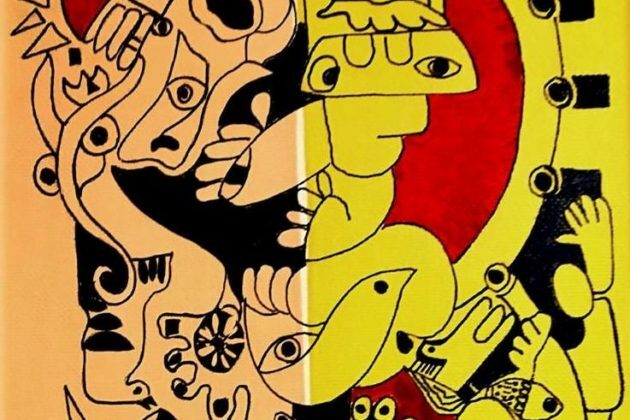 Emblematic of that diversity is an upcoming performance on Saturday, March 23 at the VFW post in west Falls Church. Six different acts will be playing music — two punk groups, three rappers representing a variety of styles and an indie rock four-piece. D.C. is famous for its historical punk scene, with names like Fugazi that defined a sound across the entire country — but much of that scene happened on the southern side of the Potomac. Although not all of its current residents are aware, Northern Virginia has a strong tradition of independent music. In the 1980s and ’90s, most of that tradition was being made in Arlington. The little county was home to the nationally-successful punk group Minor Threat, whose frontman Ian MacKaye later starred in Fugazi, as well as many other bands. 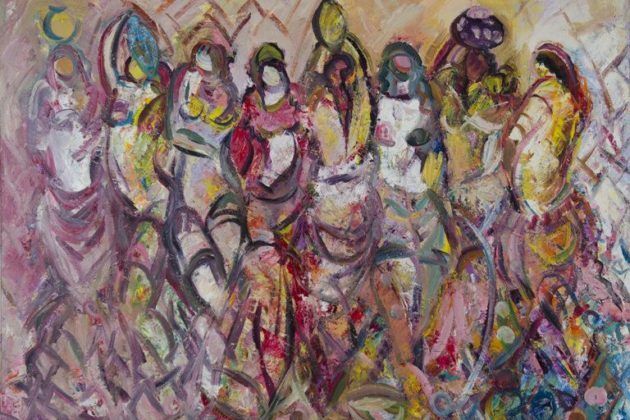 It also boasted the Dischord and Teenbeat record labels and the Positive Force activist group, which was closely associated with the “Riot Grrrl” feminist movement. These groups were often based out of houses, dotted across Arlington. The county was successful musically because it was cheap and offered easy access to the city — but, unfortunately for the punks, the rest of society caught on. In some ways, Fairfax carries on that tradition. By offering (relatively) affordable performance spaces, a large population of potential audiences and a wide network of musical collaborators, the county has a lot to offer a young musician. There are some major differences, though: today’s scene isn’t only about punk music. Also, it’s less tied to D.C. than it used to be, and has more potential to define itself as “NOVA” music. It does face some obstacles, though, including the drain of talent and attention to nearby cities like Richmond and Baltimore, and, as in Arlington, the difficulty of coexisting with some of the most desirable residential neighborhoods on the East Coast. 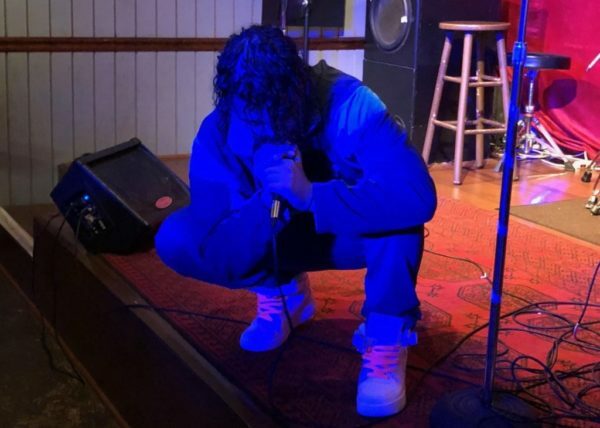 To understand what it’s like to record and perform in Fairfax today, Tysons Reporter spoke with Jason Saul, a melodic rapper native to the area. Tysons Reporter: First, how did you get to be making music in VA? 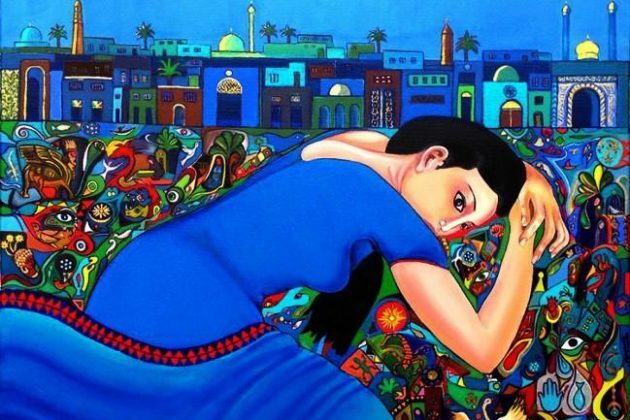 Are you originally from the area? When did you start rapping, and what’s driven you to the style you use? Jason Saul: I was born & raised in NOVA. I started writing music when I was 13 but it was never anything super serious… Once I turned 20 I realized there wasn’t anything else that brought me the amount of joy that making music does. So now I’m seeking to make music my career. My style comes from influences of music that I listened to when I was young. I’ve always enjoyed storytelling or making music the correlates with the listener. To me, music is all about feeling. Eventually I started to make more melodic music since that’s what I always gravitated towards. Tysons Reporter: Second, what should I know about the NOVA scene in general? How does it compare to other scenes around the D.C. area — does it have a particular identity compared to, say, D.C. or Maryland? Is it known for particular styles, or for particular venues? Do you want to stay around here, or, if not, where would you go? Jason Saul: The NOVA scene is very interesting when it comes to music because I see it as a big question mark on the creative map. No one can really say NOVA has a particular sound, and I think that stems from no one really making it out on to the mainstream platform yet. I know there’s Kali Uchis but that’s just one artist. I respect D.C. a lot because it’s so rich with culture but I would definitely separate NOVA from D.C. just because it really feels like two different worlds. MD in my opinion is known for their raw rapping which is great. It’s up to NOVA to see what we come up with now. I’d love to stay here and I probably will but I also enjoy the weather in the west coast. Tysons Reporter: Third, it’s pretty cool to see this wide a mix of sounds at a single show. Is that standard, would you say, or is this unusual? If it’s unusual, what helped bring it together this time? Jason Saul: It’s very exciting to see a show like this going down because it’s bringing different groups of people together. I wouldn’t say it’s the ordinary but it’s definitely going to be a good show and should happen more often. What helped bring it together was the relationships some of us have outside of music, just knowing each other really. This gives the audience and artists a great opportunity to discover some music they never thought they’d listen to. To listen to some of Fairfax’s local musicians, check out these artists, who will be performing at 6:30pm – 11pm on Saturday, March 23, at the VFW Post #9274 (7118 Shreve Road), just 10 minutes from Tysons on Leesburg Pike. There will be a $5 cover charge, and Respawn Thrift will be selling vintage clothing. 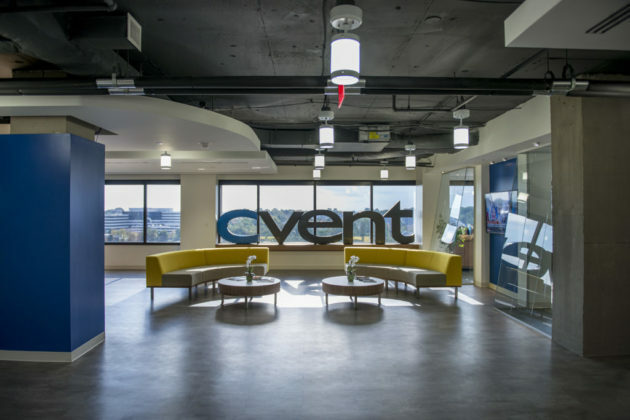 Cvent is expanding in Tysons, adding 72,000 square feet of office space to their headquarters and opening up 67 new jobs at a company that offers some unusual perks. 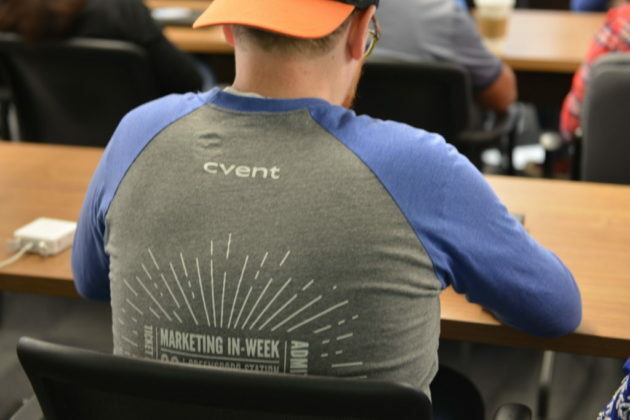 Cvent creates software for businesses to organize meetings and events. The company will occupy three additional floors of Boro Station at 1765 Greensboro Station Place. 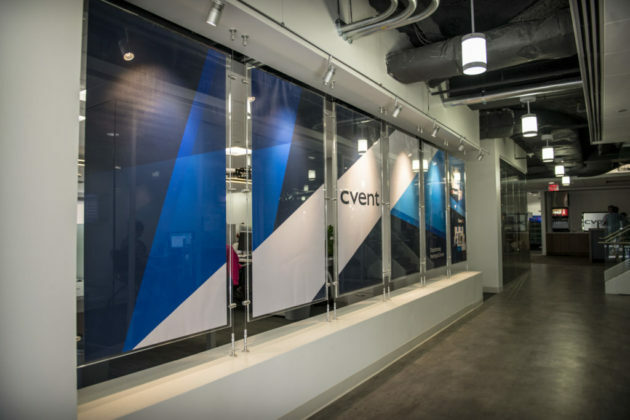 Erica Stoltenberg, a Cvent spokeswoman, said the company includes a few travel opportunities for high-performing employees. 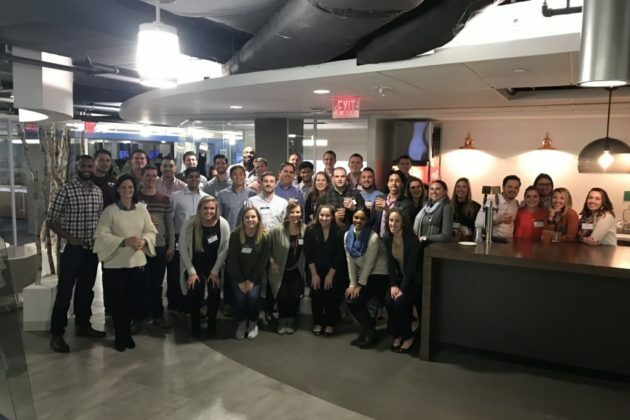 Notably, an exchange program offers an employee at the Tysons office and one at the company’s office in India a chance to “switch positions” for a few weeks. Top-performing sales reps are also given a free, all-inclusive trip to Mexico each year. Stoltenberg also bragged about the company’s all-out Halloween party, which includes divisions competing for best costumes and best overall decorations. Other perks at the company range from the standard “free office coffee” to onsite massages and other wellness activities. The company recently expanded into the fifth floor of their headquarters at 1765 Greensboro Station, just south of The Boro development. Stoltenberg said part of that move included discussions with employees to figure out what enhancements or additions were most needed. 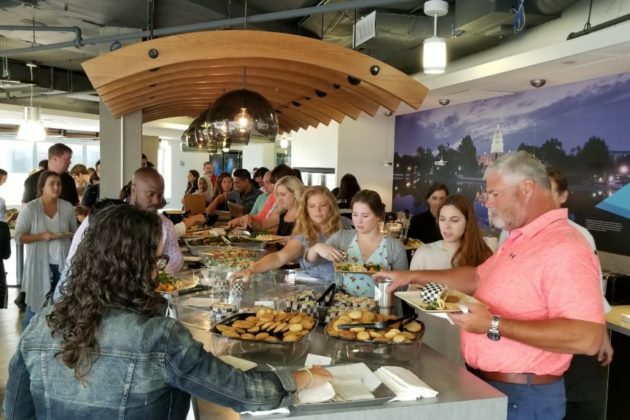 “As we expand, it’s important the new floors are constructed in a way that means we have the best environment for our growing team,” said Stoltenberg. Can Vienna’s Small Businesses Survive in A Big Box/Amazon World? Business is hurting in Vienna. The Maple Avenue Market closed last week, as did the GameStop, with an employee there citing increasing rents as the leading cause. As store after store shuts its doors, there are questions swirling around town about whether local businesses can stay competitive with new developments surrounding Vienna — and if so, how? At a town council meeting in January, town business liaison Friderike Butler said businesses on side streets were being hit particularly hard. Peggy James, executive director of the Vienna Business Association, told Tysons Reporter that two big challenges are facing local stores. “It’s very expensive and we’re pretty tight on parking,” said James. What’s driving up the rent? It’s an old maxim anyone in real estate will be familiar with. Over the years, James said the Saturday morning shopping at mom-and-pop stores that had turned Vienna into a local destination disappeared as sales went to big box stores and Amazon. But all three experts noted that there are ways to help local businesses survive. From a policy standpoint, Butler said the Town of Vienna can help make parking more accessible. Town Councilmember Howard Springsteen also recommended the Town Council consider hiring a full-time economic development specialist, an idea that’s been tossed around the council for two years. For businesses, Shafroth said survival hinges on finding a niche that can’t be as easily replicated by bigger stores or by Amazon. As part of that, Shafroth also said smaller stores should capitalize on the advantages physically touching merchandise offers. And at the individual level, there’s an obvious answer for how locals can help small stores survive. 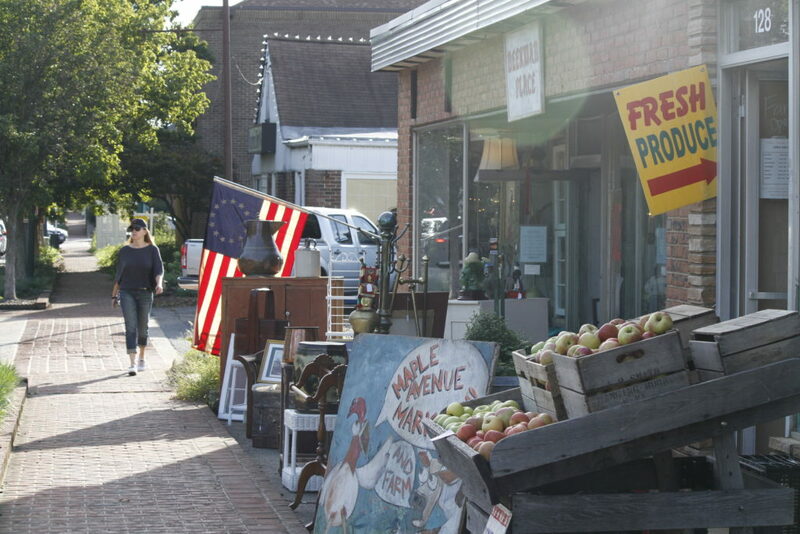 James also noted that it can be too easy for locals to blame new developments, like those coming in with the Maple Avenue Commercial zoning changes, for the hardships local stores are facing. For all its faults, it’s hard to say Tycon Courthouse doesn’t stand out. More locally known as the “Toilet Bowl” or “Stargate” building, Tycon Courthouse on Route 123 just west of Leesburg Pike is most notable for it’s over seven-story tall ring in the front of the building. 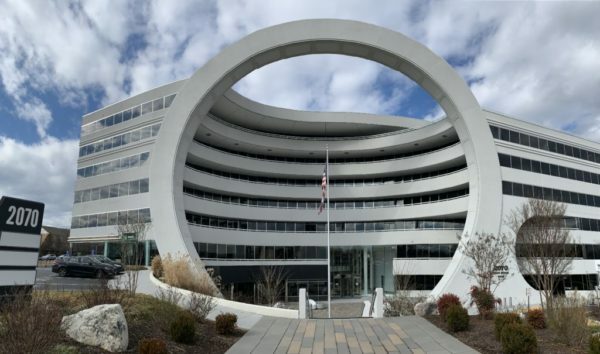 But there was a time where the building, labeled the ugliest in Virginia in Business Insider’s 2018 list of ugliest buildings in every state, was once the height of local architecture. It was, at one point, the largest office building in Tysons and the first structure to include massive structure parking, able to accommodate a then-record 900 cars. It was built in 1983 in the middle of a “screaming architecture” fad — a Washington Post article at the time said the buildings were designed to be their own advertisements. They were reflective of peak Reagan-era style, where notability was more important than pleasing aesthetics. Architects Volker Zinser and Barry Dunn were credited with the project. There are several urban rumors about the project, like that it was designed to look like an “O” for the Olivetti Company, or the lenses of a Nikon camera, but an interview with Zinser at the time said he was inspired by a book about 19th-century French architects who designed projects that explored geometric volumes. In keeping with the style, Zinser said the fact that the building was being talked about was more important than what people were calling it. 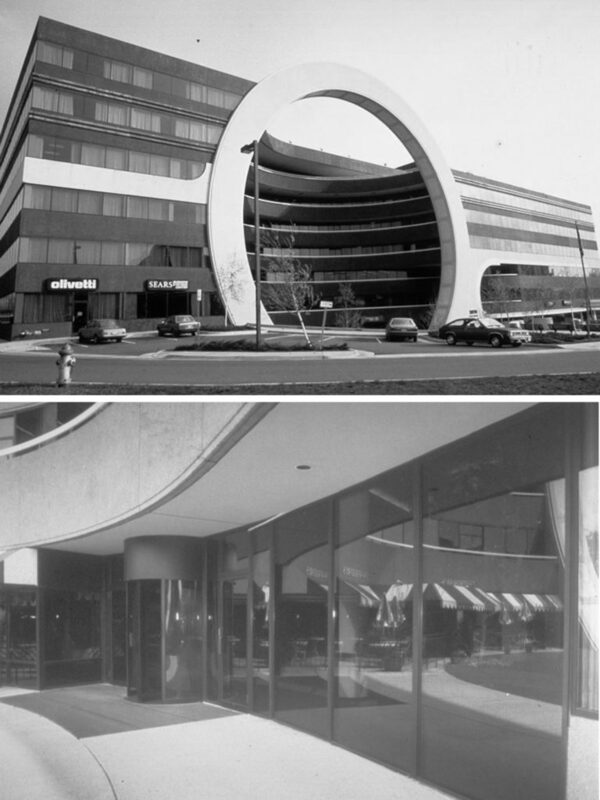 The screaming architecture fad was centered around Fairfax County. Experts at the time called it medieval, noting that businesses were grabbing spaces and turning them into private fortresses. The Blade Runner-esque Tysons Office Center on Route 7 and Gallows Road, sometimes called the “Flash Cube” building, and Tycon Towers, the 17-story “shopping bag,” were other local examples of this design. (Updated 3:15 p.m.) Fairfax is the second richest county in the nation — yet at Second Story, just south of Tysons at 2100 Gallows Rd, there’s a desperate need for bed space for homeless teens. 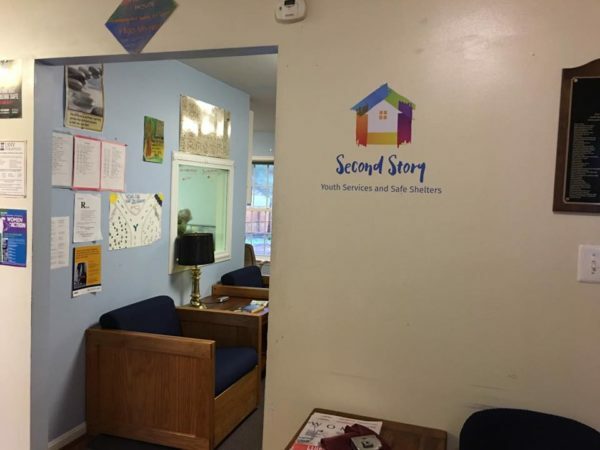 Second Story CEO Judith Dittman says the organization provides a temporary shelter for teenagers in a crisis, but there is a waitlist of 35 people still waiting for a space to open up. The waitlist averages 50 people for the homeless youth and young mothers programs. Dittman said those on waitlists are forced to either stay on couches or in the street, where they could become caught up in human trafficking. 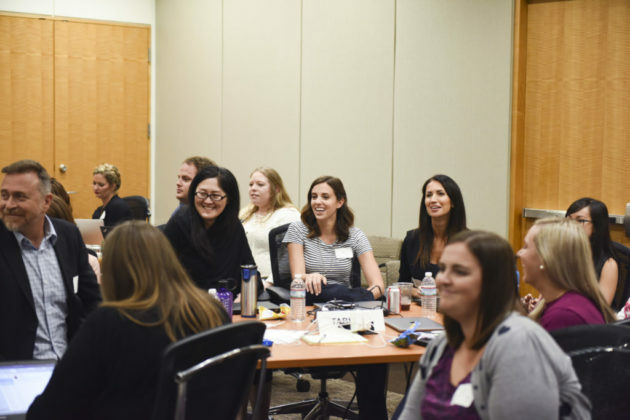 “Too many times, people look at me and say ‘that doesn’t happen in Fairfax,'” Dittman said. But, in 2017, Fairfax County Public Schools reported that 1,200 young people in the county had no support from a parent or legal guardian. A report by Fairfax County’s Department of Health and Human Services found that 18,857 children, or 7 percent of all local children, were in poverty. The shelter takes in young people who have run away from home, or have no home to go back to, and offers a three-week refuge. The program functions as a shelter for people between ages 13-17, offering counseling, meals, and guidance. Lauren Witherspoon, the development coordinator for Second Story, said the goal is family reunification and about 95 percent of the teens are reunited with their family at the end of the program. After they return to their family, there are periodic check-ins to see how the child is handling the situation. From its founding in 1972 through just two years ago, Second Story was known as “Alternative House.” Dittman said that as the organization started branching out, leaders found the original name was no longer reflective of the scope of the work done there. 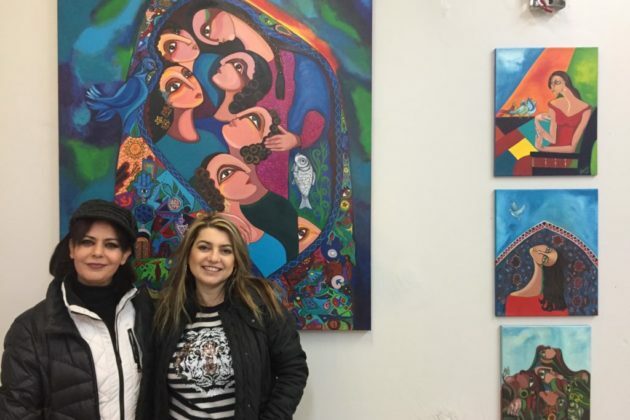 In addition to the youth shelter, the organization also offers after-school activities, programs for young mothers and other programs aimed at preventing homelessness and crises in the first place. Witherspoon said the organization targets children as early as fourth grade. That may sound young, but Witherspoon said they are competing with gangs that typically recruit at around eight or nine years old or human traffickers, who can grab children as young as 11 or 12. Another program takes homeless teens and focuses on making them self-sufficient over an 18-month period. Counselors at the program help teach participants skills from how to load a dishwasher to how to manage finances. The charity was recently the subject of fundraising and toy donation drives at the Tysons Biergarten and the Tysons Partnership. Roughly one-third of the organization’s funding, or $1,209,510, comes from community support. Another third comes from federal, state and local grants, but Witherspoon said the organization has been struggling as costs continue to rise, but federal funding remains stagnant. Over 85 percent of the organization’s funding, or $2,832,169, goes to program services. The remaining funding is split between development, management, and general funds. The organization hosts tours on the second Tuesday of each month. Second Story also hosts volunteer and community service opportunities. Volunteers help do things like cook and answer the door to allow counselors to focus on helping teens. Vienna tends to flood. Recent heavy rainfall has not only impacted local streams, but locals may have seen high water in Vienna’s downtown area near the Town Green. It’s an issue that town staff have been working for years to address, and solutions have been identified, but year after year have remained unfunded. A report presented to the Vienna Town Council in December 2016 examined the state of Vienna’s sewer infrastructure, particularly at the intersection of Maple Avenue and Center Street N. in the center of the town. The study found that there were places that experienced significant flooding where existing sewer infrastructure was unable to handle storm volume. Town staff confirmed that improvements suggested in the study were included in the CIP, but have yet to receive funding. In moderate storms, flooding first occurs along Center Street at the location of the N Condos building and Starbucks parking lot. In more intense storm events, flooding occurs in the area of the Freeman House Museum, at Church Street NW and Dominion Road NE. Flooding also occurs near the intersection of Mill Street NE and Ayr Hill Avenue. The report notes that flooding at the Starbucks is generally seen as the first sign of storm sewer capacity issues. The report noted that the ponding at these issues is more indicative of capacity problems than issues with draining. The study assessed every outfall and junction in downtown Vienna and found that the system is unprepared for handling severe storms. 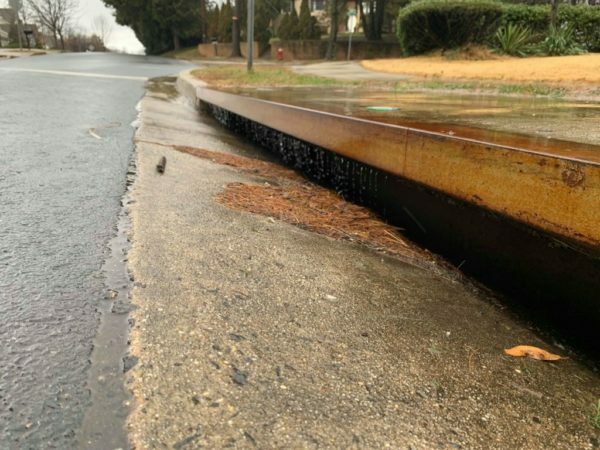 “The flow capacity of portions of the existing storm sewer system is insufficient to carry the stormwater calculated for a 10-year frequency storm,” the study said. Ten-year floods are floods that have a 10 percent chance of happening in any given year, though there is some concern that this type of descriptor can lead to a false sense of security for those in areas prone to flooding. Crucial to any fix to the local sewers, the study said, would be preventing flooding at the Freeman House and Starbucks, which are most prone to flooding. The report recommended clearing debris and obstructions to sewer flow but that more substantial improvements will be needed over time. 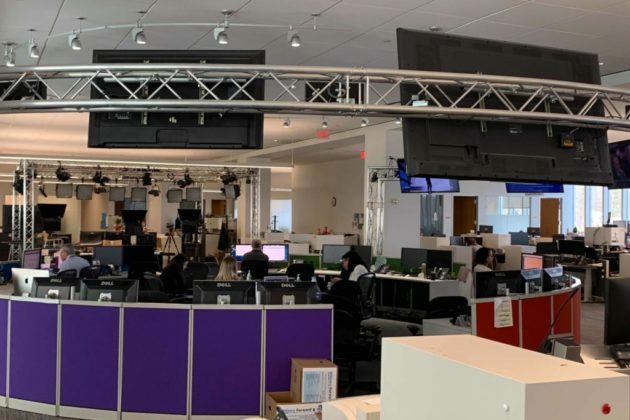 The Mothership is one of several podcasts run through USA TODAY at their headquarters Valo Park, a sprawling state-of-the-art complex tucked away in Tysons’ northeast corner. 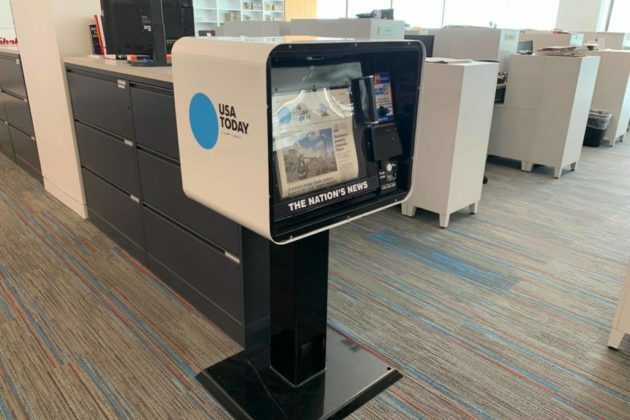 It’s no secret that media companies, including USA TODAY owner Gannett, are struggling to find a way to stay afloat. The company recently resisted a hostile takeover. But Shannon Green, senior podcasts producer for USA TODAY and co-host of I Tell My Husband the News, said podcasts have been at the forefront of the company finding new ways to tell stories. USA TODAY podcasts range from Accused, a several-season true crime podcast put together by a team at The Cincinnati Enquirer, to the sports-themed For the Win. The Mothership is hosted by Truitt, technology reporter Brett Molina and TV critic Kelly Lawler, and has been running weekly for four years. 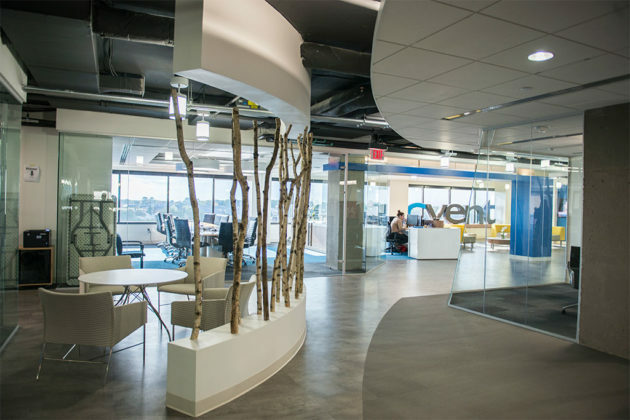 While Tysons has not traditionally been considered one of the country’s entertainment hubs, Molina said there are some distinct advantages to working outside of Washington D.C. 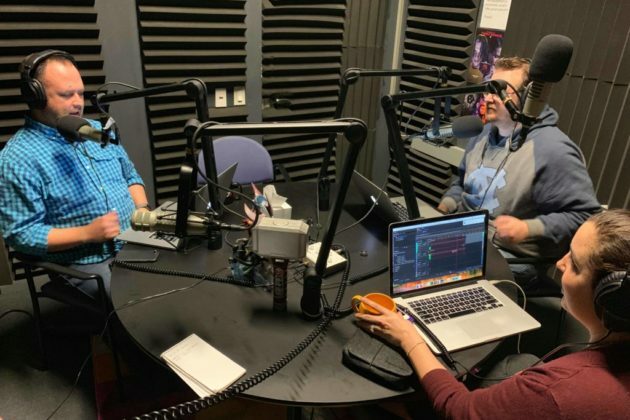 But the non-traditional location means the podcasts work with an eclectic group of guests, like novelist Brad Meltzer or “Batman” writer and Arlington resident Tom King. “Being out here means we have to catch whoever is in the area,” said Truitt. New episodes of The Mothership air every Friday. This week’s episode is a discussion of romantic comedies. Molina noted that the group narrowly avoided making a “Tribute to Liam Neeson” episode, quickly scrapped after the actor made some troubling confessions. Green said she was approached to run the podcasting at USA TODAY shortly after Serial brought podcasting into the mainstream in 2014 and the company leadership began to see podcasting’s potential. Green said investigative stories are unique suited for podcasts, using voices to convey ideas and emotions that can’t be conveyed in text. Not all of the podcasts garner enough downloads to have advertising, but Green said enough do to bring in revenue and help fund more experiments with the medium. One investigative podcast, The City, profiled the rise of a massive illegal dump in Chicago, including an augmented reality component that helped demonstrate the story of how the empty lot evolved over time. 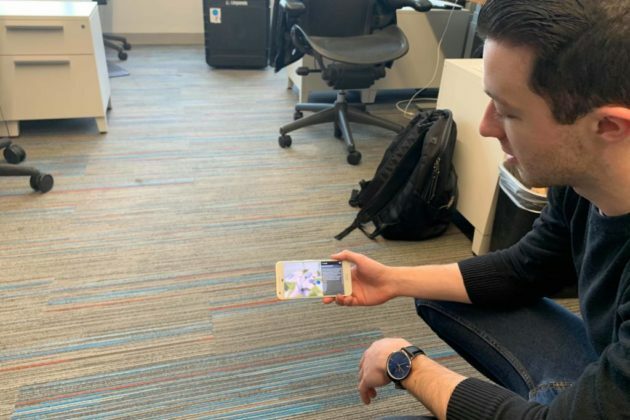 Green said the augmented reality technology helps bring a new visual level to a traditionally auditory form of storytelling. Green also said bringing in new talent from nearby schools has been part of bridging the generational gap. 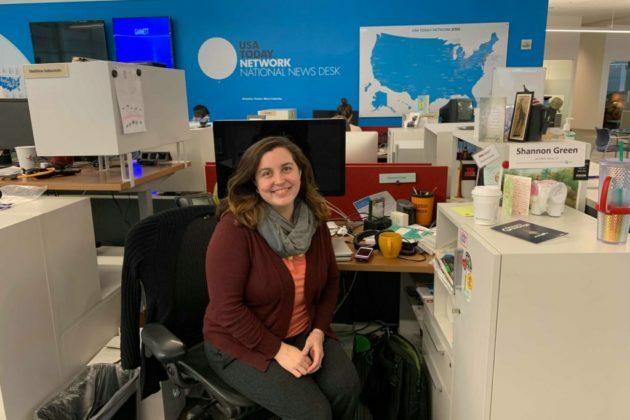 Kate Gardner, a student at the Madeira School in McLean, interns at USA TODAY but also uses the equipment to help put together an audiodrama: The Ark of Light. Green said working with Gardner that she’s learned a whole new side of audio production involving Foley sound effects and other methods. Green said podcasting, audio dramas, and other types of audio-entertainment have become such a hit, primarily due to the intimate connection they offer listeners to the story. “Spoken storytelling is extremely intimate and emotional,” said Green. 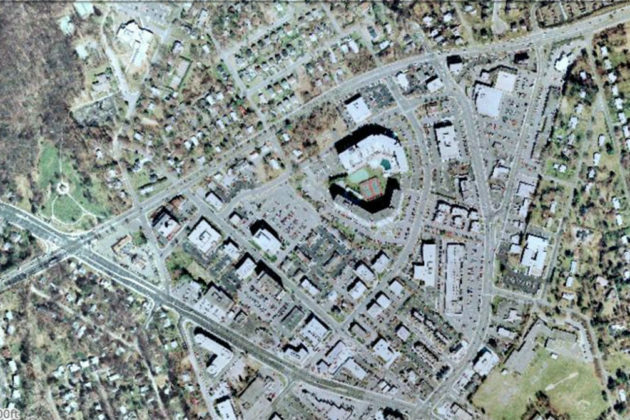 Fairfax County’s aerial photography can offer a view of the startling growth of some some parts of the area, charting Merrifield‘s growth from a lonely drive-in theater to today’s Mosaic District, changes to Tysons Galleria and the commercial properties around Route 7, and Tysons East’s transformation from suburbs to an urban center. But McLean’s story is more like Maple Avenue’s, where rapid growth has been followed by decades of stagnation. An ongoing effort to update zoning for downtown McLean, called the McLean Community Business Center (CBC), has faced pushback from some local residents who say the plans will transform McLean into a new Tysons-style development. 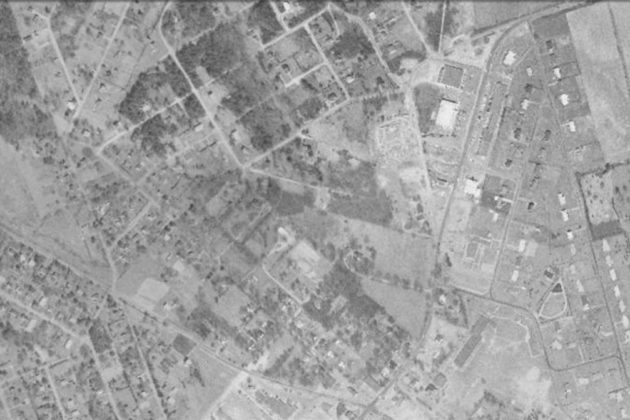 While the town of McLean was founded in 1902, aerial photography shows that even as late as the 1960s there wasn’t a developed center of town. The first developments in the CBC, like McLean House Condominiums in the northeast corner and Langley Shopping Center a little south of that, show up in photography from the 1970s. 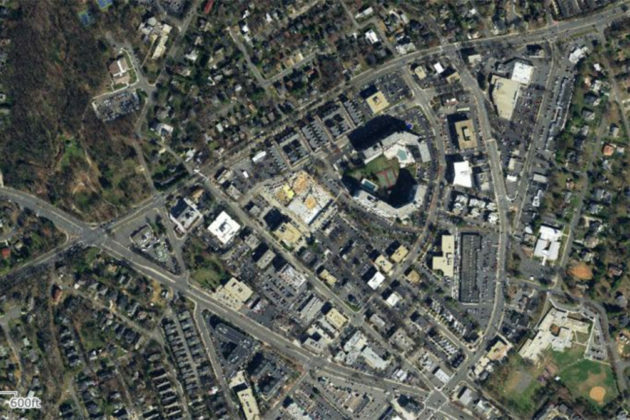 Between then and 1990, much of the area along Old Dominion Drive was developed and new shopping centers bloomed at the southern edge of downtown McLean. But in all of the photography between 1990 and 2017, that development grinds to a halt. At several of the McLean CBC meetings, locals lamented that McLean didn’t really have a “sense of place” and that much of the downtown was defined by gas stations on every corner and vacant buildings. The plans for the CBC call for changing some of the transportation routes through the downtown McLean to make the area more pedestrian friendly and allowing new, mostly residential and commercial developments downtown.